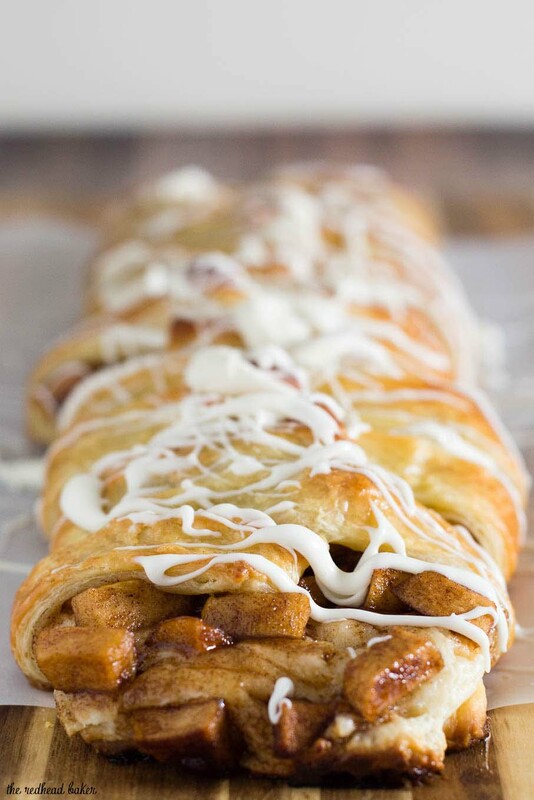 An apple Danish braid is a delicious fruit-filled pastry to serve at brunch. 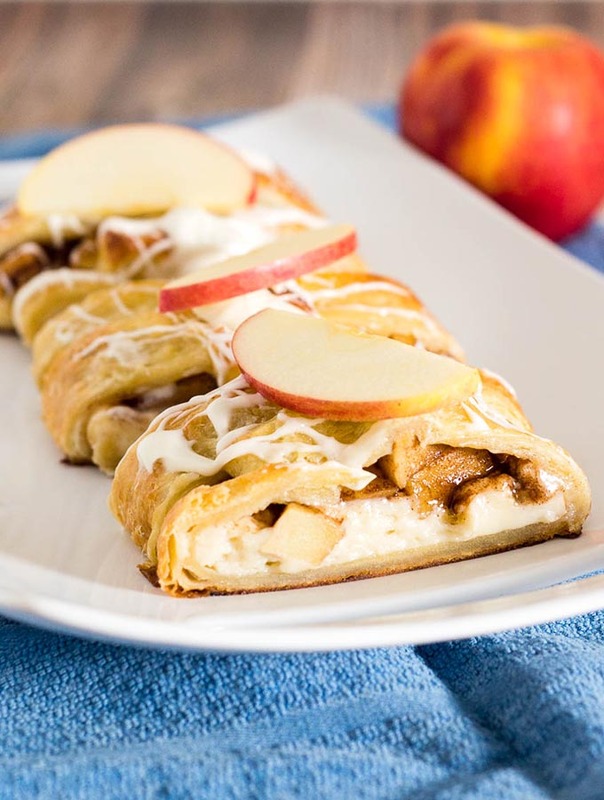 Flaky pastry covers sauteed cinnamon apples and sweetened cream cheese. It’s BrunchWeek time again, hosted by Terri of Love and Confections. This is my third year participating, because brunch is my favorite meal. We have several great sponsors this year, who’ve generously donated some wonderful prize packages, which you can read about on my giveaway page. As I mentioned in my post yesterday, I love sweet brunch dishes, so of course, I needed to make one for BrunchWeek! In past years, I’ve made pancakes and French toast. This year, I tackled Danish pastry. Danish pastry often intimidates home bakers because of the process involved in making the laminated sweet dough. “Laminated dough” is a term that refers to how the butter is incorporated into the dough. It becomes laminated in flour, which creates a tender, flaky pastry. One example is croissants. In traditional recipes, you literally wrap a block of butter in a flour-sugar-water-and-yeast dough (yes, yeast. Don’t panic. Red Star’s Platinum Yeast is practically fool-proof). You then roll it out, fold it, and re-roll it several times. It’s HARD to do that at home (professional bakeries have the benefit of a machine called a sheeter, which quickly and easily rolls out dough for you), so this recipe takes a shortcut by cutting the butter into the dough using a food processor. You still roll, fold and re-roll the dough, but it takes a lot less elbow grease. The process does still take a lot of time, so be prepared for this process to take at least two days. In order to create a tender pastry, the dough needs a LOT of time to rest between rolls and folds. But believe me, the final pastry is definitely worth the work. This same dough can be used to create the classic round, fruit-in-the-center pastries that you see in bakeries and coffee shops, but those can be time-consuming to cut and shape, especially when making them for a crowd. Hence, we roll out the dough to a large rectangle, mentally divide it into thirds, and create a braid. Creating the braid looks a lot more difficult than it really is, so I won’t tell if you insinuate to your impressed guests how you SLAVED over creating this beautiful masterpiece of a pastry. If they claim that it’s just too pretty to eat, that just means there’s more for you. Wink, wink. The filling is delicious enough to eat with a spoon, but try and restrain yourself. Lady Alice apples from Rainier Fruit are cooked in a mixture of brown sugar and butter just until fork-tender. They are a great baking apple that doesn’t turn to mush when cooked. They’re piled on top of a sweetened cream cheese mixture that almost tastes like cheesecake. An egg wash (a mixture of egg and water brushed over the pastry just before baking) is optional, but I don’t recommend skipping it. It’s the secret that bakeries use to get that beautiful shine on all of their baked goods. And the finishing touch is a drizzle of simple icing: a mixture of powdered sugar, cream, and Nielsen-Massey vanilla extract. Nielsen-Massey’s almond extract can be used in place of the vanilla, if you prefer that flavor instead. This is a rich pastry, so cut these rather thin, especially if you have several other brunch dishes being served. 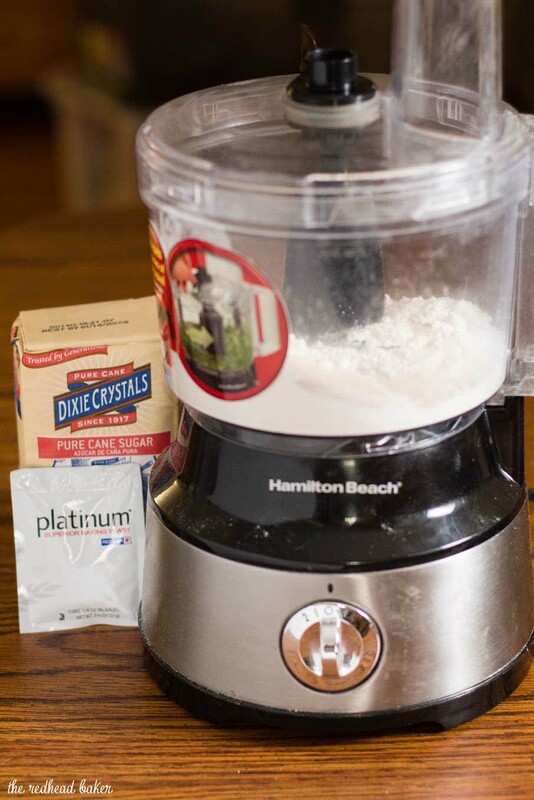 Combine the flour, sugar, yeast and salt in the bowl of a food processor. Add the butter and pulse to combine. The mixture should be the size of small peas. Transfer this mixture to a medium mixing bowl. In a measuring cup, whisk together the half and half, egg and vanilla extract. Pour over the dry ingredients and fold with a rubber spatula until the dry ingredients are fully moistened and forming large clumps. Turn the dough out onto a piece of plastic wrap, shape into a small rectangle, and wrap well. Chill for at least 3 hours, and up to 2 days. On a lightly floured surface, using a floured rolling pin, roll the dough out to an 8-by-15-inch rectangle. 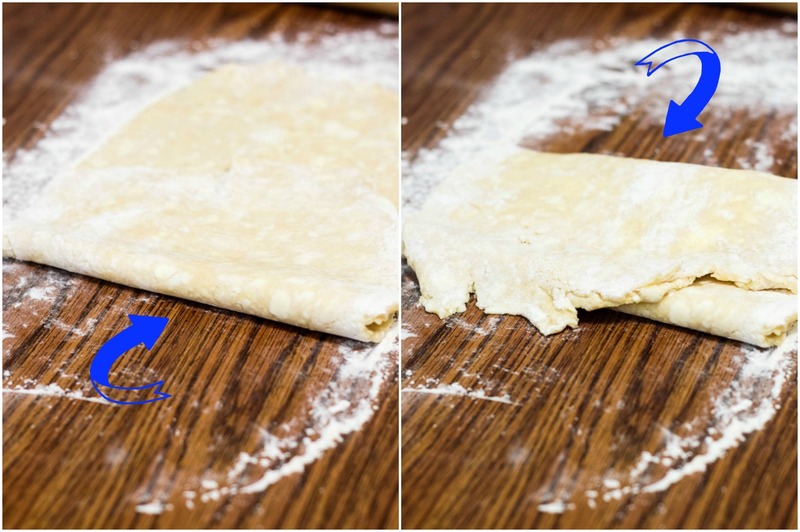 With a short side facing you, fold the dough in thirds like a letter, bringing the top third of the dough down, then folding the bottom third up. Use a dough scraper to help lift and fold the dough if necessary. At this point, the dough will have visible butter pieces; as you roll and fold the dough the pieces will become laminated in flour and no longer visible. Rotate the dough 90 degrees. Repeat the rolling and folding process, then rotate the dough once more and roll and fold again for a total of three turn-and-folds. As you work, dust the work surface, your hands and the rolling pin with flour as necessary. Wrap the dough in plastic wrap and refrigerate for at least 1 hour or overnight. Repeat the entire rolling and folding process three more times for a grand total of six turns. If the dough starts to fight you and become difficult to roll at any point, just chill it in the fridge for an extra 10-minute rest. Wrap the dough and refrigerate for at least 2 hours, or overnight. 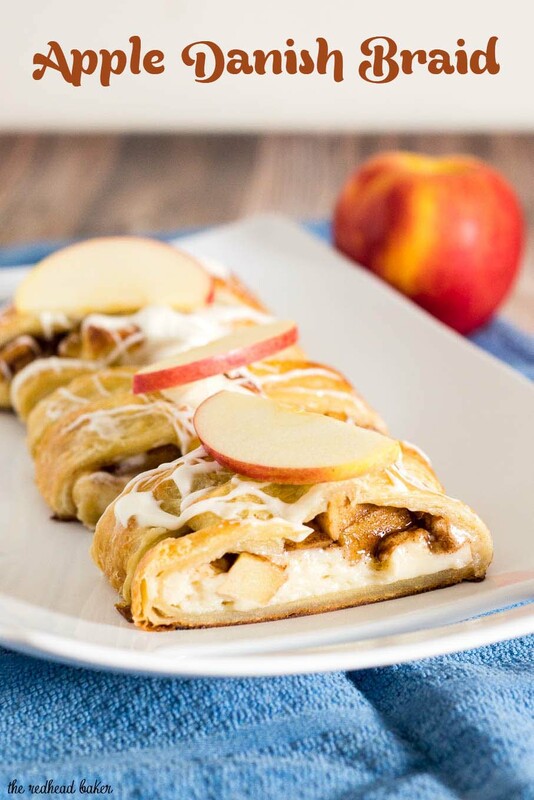 On the day you plan to bake, make the apple filling: melt the butter over medium heat in a large skillet. Add the brown sugar and cinnamon, and stir to melt the sugar. Add the apples and toss to coat. Cook the apples, stirring frequently, until fork-tender (about 5 minutes). Remove the apples from the skillet with a slotted spoon to a bowl, discard any liquid left in the skillet. Set the apples aside to cool. Make the cream cheese filling: in a small mixing bowl, beat together the cream cheese, sugar, vanilla and flour. Set aside. 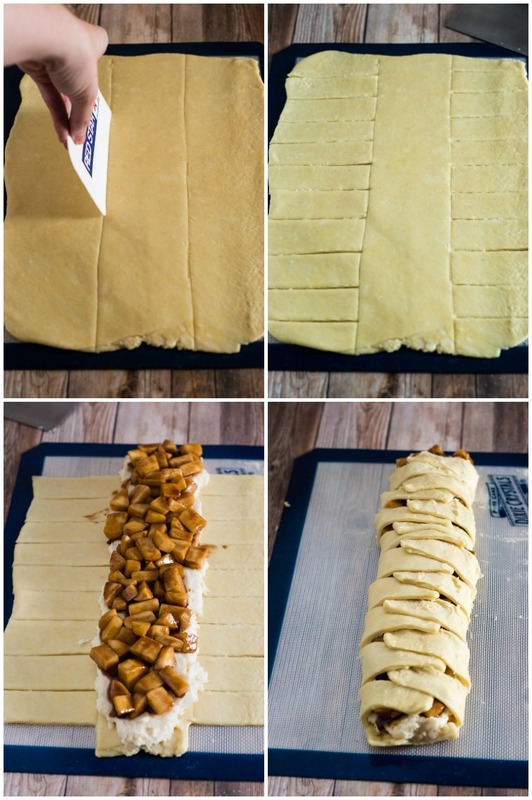 On a lightly floured piece of parchment paper, roll the dough into an 11-by-14-inch rectangle. Arrange so a short side is facing you. With a bench scraper or the backside of a knife, very lightly mark off a 3-inch section lengthwise down the center of the dough. (Don’t cut through the dough, you’re just creating a guide for yourself.) Cut 1-inch strips perpendicular to the lengthwise guidelines, on either side of the 3-inch section. Cut off the top and bottom corner strips, leaving the center flap. 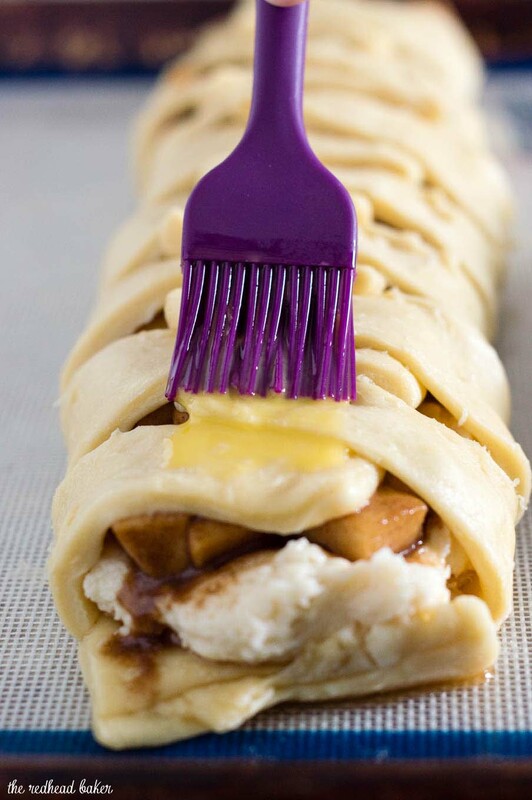 Spread the cream cheese mixture down the 3-inch section of the pastry, leaving about an 1/8-inch border on all sides. Spread an even layer of the apple mixture over the cream cheese. Fold up the top and bottom ends of the center section to create a barrier for the filling. Starting at the top, fold each strip in at a slight angle over the filling, alternating from left to right. Make sure the strips are overlapping by about 1/2 inch so they don’t open up while baking. Using the parchment, move the filled pastry onto a rimmed baking sheet. Cover the pastry loosely with plastic wrap and let rest until slightly puffed, about 1 hour. While dough is rising, heat the oven to 425 degrees. Make the egg wash: in a small bowl, beat together the egg and water. Gently brush the top and sides of the pastry with the egg wash. Bake for 10 minutes then turn the pan 180 degrees and reduce the heat to 375 degrees. Bake until deep golden brown and puffed, another 10 to 15 minutes more. Remove the pan from the oven to a wire cooling rack. Just before serving, whisk together the icing ingredients. Add more heavy cream by the teaspoonful until it reaches the desired drizzling consistency. Drizzle the icing over the braid with a spoon. Slice the braid with a serrated bread knife into 8 pieces and serve. I have a lot of Danish in my blood, but have to admit, I have never made one! You have made it look so easy. This sounds delicious! I love pastry braids! This is absolutely stunning! I bet it tasted amazing, too! This looks really amazing. Not too hard to make, but sure will impress guests! This looks delicious and I’m tempted to give it a go this weekend. I’m not familiar with RedStar Platinum yeast — is it like a fast-rising/ instant yeast? It is an instant yeast blended with dough enhancers commonly used by professional bakers that will make your dough more forgiving. That looks amazing! You have inspired me to make my own pastry next time. 100% wish I had a slice of that right now. That braid looks absolutely, perfectly delicious. I have had this recipe in the back of my mind for about a year and finally made it this weekend. It was wonderful. 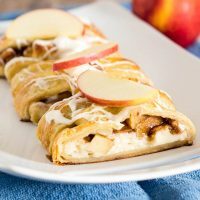 The dough was soft and flaky, and the filling was a nice combination with the cream cheese and sweetened apples. Thanks for sharing!